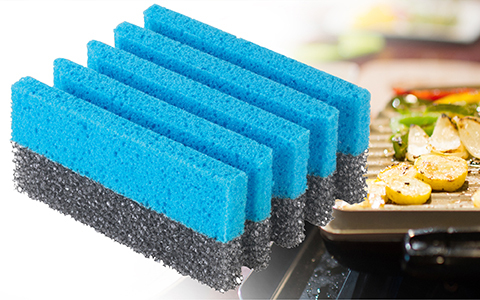 Custom grill cleaning sponges perfect for cleaning a grill from George Foreman. Make using your George Foreman grill even easier with our custom grill sponges. The unique design fits perfectly with the channels of your grill for easy, no-fuss cleaning, with two sides for simple wiping and tougher scrubbing. The sponges are safe on nonstick and come in a convenient three-pack for even more cleaning power. Get back to grilling, fast! The specially designed sponges fit into the grooves of your George Foreman Grill to quickly remove grease and grime. Safe to use with any George Foreman grill. Scrub and sponge, all in one! 3 Pack Grill Cleaning Sponges is rated 3.0 out of 5 by 3. Rated 2 out of 5 by Roy531 from grill The sponge works great, but the grill I have had for the past 6 months the non stick stuff is coming off, not sure if it is because of the sponge or defective grill, second grill I have had and both of them the non stick stuff has come off in less than 6 months. Won't buy another one. Rated 2 out of 5 by sapphire from Only purchase available Have used these since I bought my grills years ago, and the sponges just don't last like they used to....unfortunately they offer no other product to be used..so I am trapped into buying them. They flake off and end off on my countertop....Wish they would make something that lasts longer.